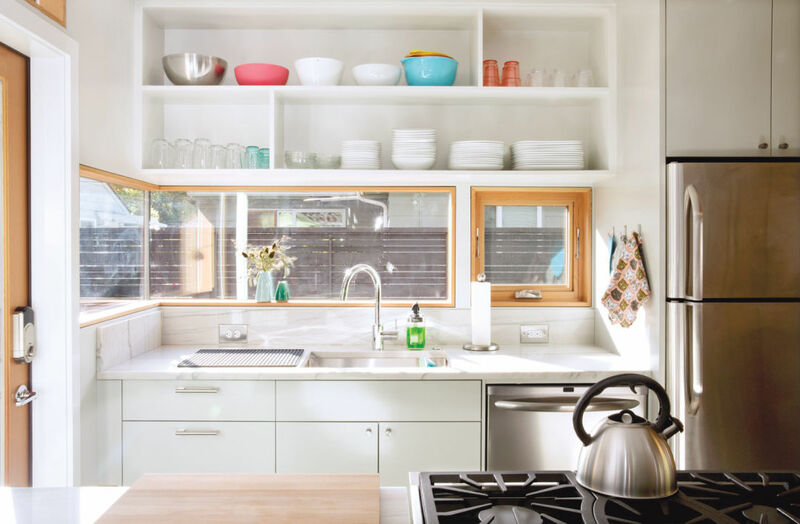 Here’s how to make the most of 800 square feet. Downstairs, the ADU’s long, lean main room does a lot in its trim footprint. Smartly compact furnishings sit low to the ground. Nudging up against Greco and Banker’s main house, a 1913 bungalow, this plot in inner Southeast Portland was previously the domain of a flock of chickens, all named after Greco’s late Italian aunts and grandmothers. After Francesca, Loretta, Carmella, and the others followed their namesakes into the Great Beyond, the homeowners started to reconsider their yard. 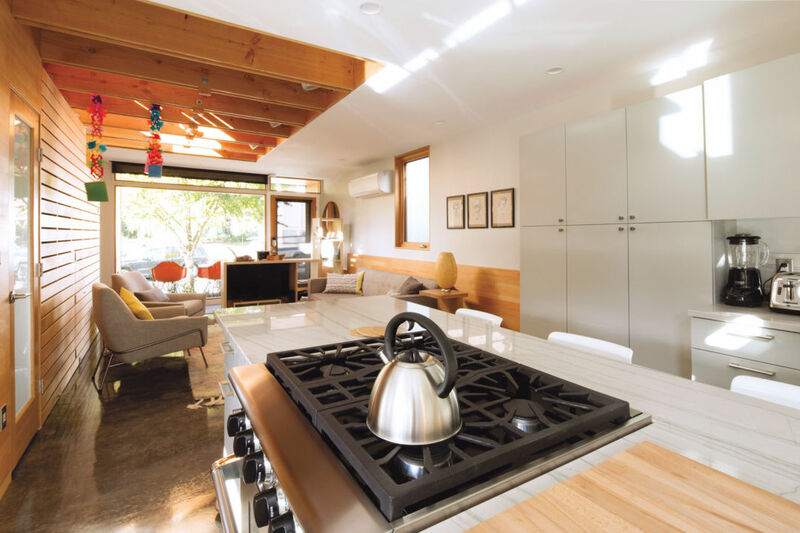 They decided on an accessory dwelling unit (ADU), which would host guests for now, and ultimately become the couple’s primary residence. 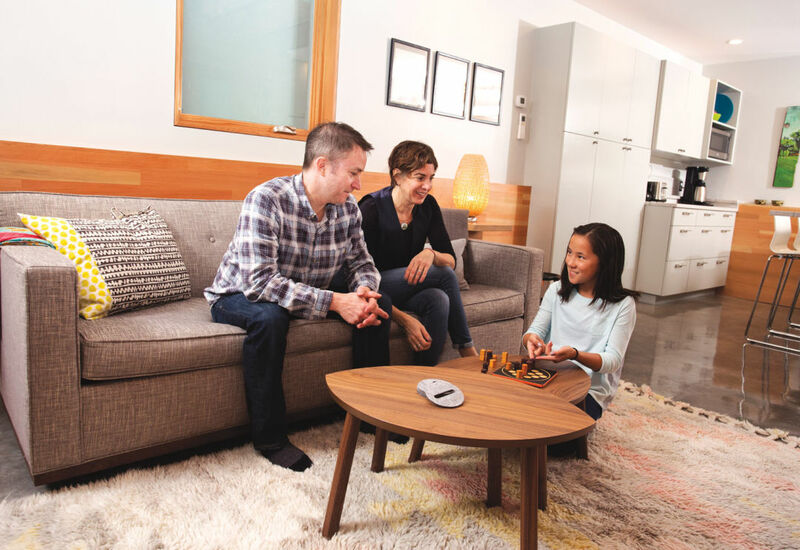 “We like the idea of passive income, as well as a place for friends and family to stay,” says Banker. 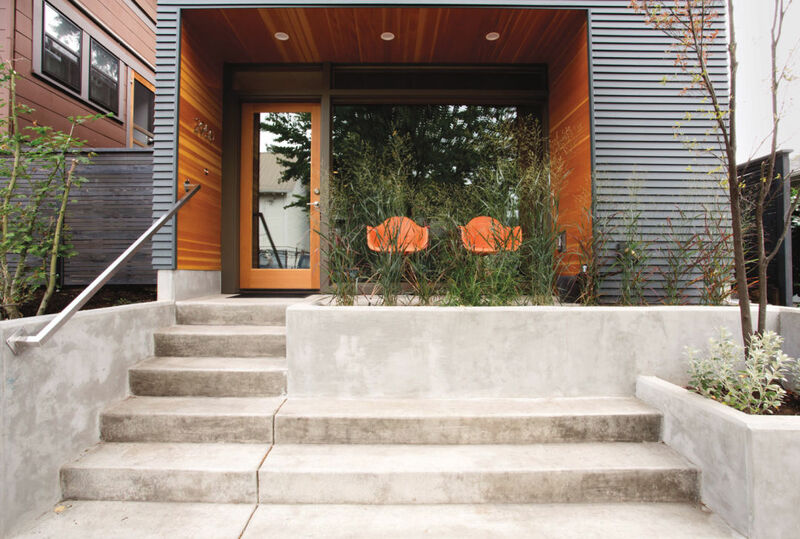 “And in the long term, we like the idea of living here and going to Mexico in the winter.” A contractor who owns True Blue Construction & Remodeling, Banker has collaborated with Wilson for years (he built Wilson’s own house); Greco, a professional interior stylist who owns Pine Street Design, rounded out the team. In a full-size kitchen, a large center island and custom cabinets are built for efficiency. Following design dictums of modern, bright, and airy, the trio visually and literally maxed out the space. Upstairs, ceilings in both bedrooms are vaulted; downstairs, the living room is topped by exposed wood beams that extend the view upstairs. Windows are used strategically: a seven-foot square of glass fronts the house, skylights pull in light from above, and long windows slice across walls. 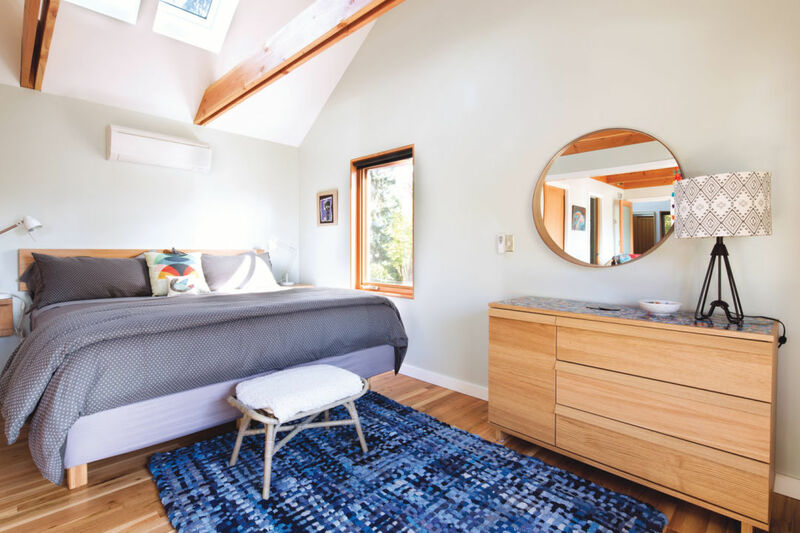 Triangular panes of glass above the bedroom doors provide soundproofing while opening the space, as does a frosted-glass sliding double door to a bedroom. Strategically placed accessories and decorations add pops of color. 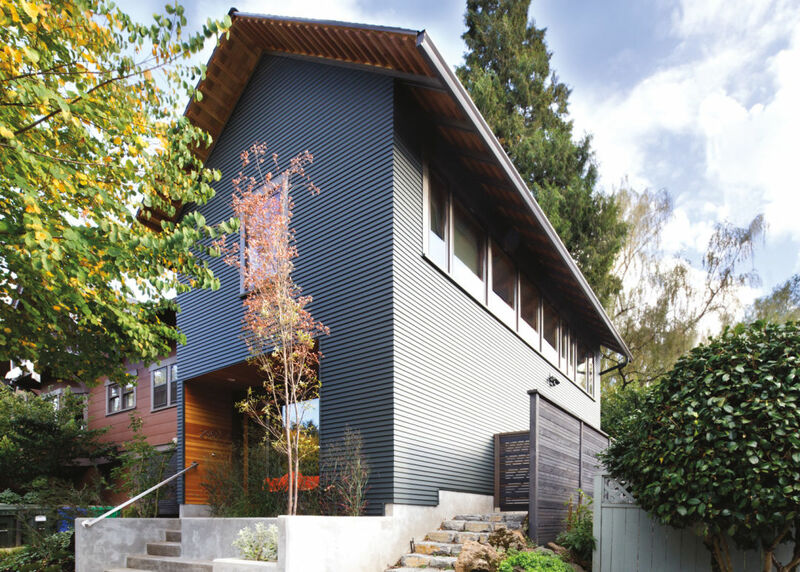 Other space-saving functions are both smart and subtle, such as the radiant heating under both floors, which Banker installed himself (“my first and last time doing that!” he says), a tankless water heater, and a powder room tucked into the empty space under the stairwell. For the finishes, Greco selected a neutral palette of grays, whites, and wood. “We wanted it to feel serene and calm in here, like a modern beach getaway,” she says. “Plus, this place doesn’t hold enough space for lively colors.” A glossy, six-inch slab of raw concrete flooring flows underfoot downstairs, white paint covers the walls, and bright wood warms surfaces throughout—from the Doug fir staircase and window trim to side tables and a headboard that Banker handmade from alder remnants. Pillows, blankets, and art provide small doses of color. 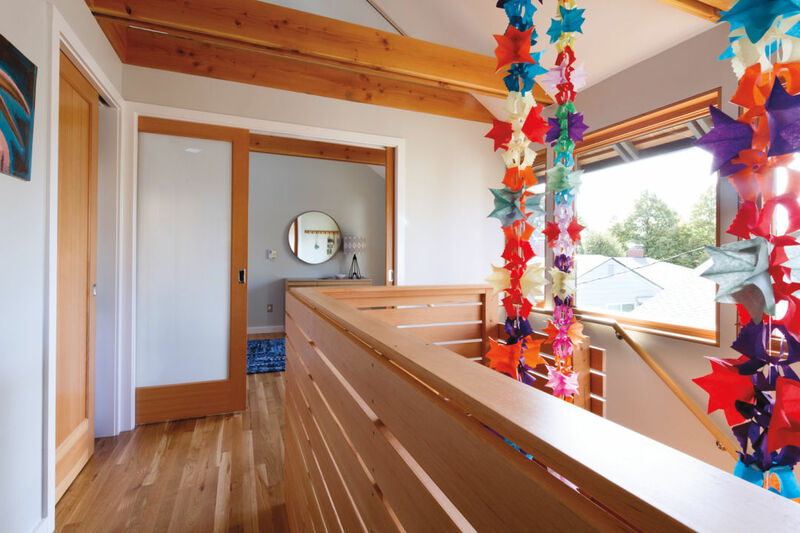 Natural light from windows, skylights, and mirrors helps the bedrooms and outdoor shower feel bigger. Furniture was also crucial to creating the illusion of space. As Greco says, “If you have a huge living room, you can buy giant furniture and rearrange it four different ways. But we had to get every dimension of the furniture right to fit in here.” Beds were placed so there’s just enough room to scoot alongside. The custom couch from Perch doubles as a sleeper. 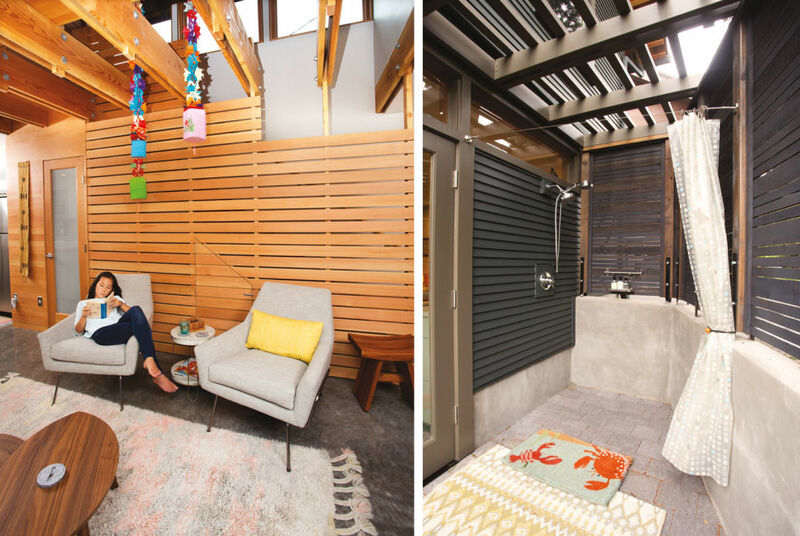 And beyond adding to the beach-house vibe, the outdoor shower provides a valuable second bathing space. The full article can be viewed HERE at the Portland Monthly website.